This model is available as an automated tutorial by selecting Model Examples and Tutorials... > Fluid Dynamics > Vortex Flow from the File menu. Or alternatively, follow the step-by-step instructions below. Press the Constants Toolbar button, or select the corresponding entry from the Equation menu, to open the Model Constants and Expressions dialog box. Enter the following expressions for the viscosity, vortex period, and reference solutions. Select Equation Settings... from the Equation menu. Enter nu into the Viscosity edit field. Enter u_ref into the Initial condition for u edit field. Enter v_ref into the Initial condition for v edit field. Enter p_ref into the Initial condition for p edit field. Prescribe the reference velocities on all boundaries using the Inlet/velocity boundary condition. Enter u_ref into the Velocity in x-direction edit field. Enter v_ref into the Velocity in y-direction edit field. Also prescribe the reference pressure on all four points. Note that since no outflow is present in this model, a reference point with pressure p = 0 has already been prescribed. This is necessary to ensure convergence and a unique pressure for stationary problems without any outflow boundary conditions. Enter p_ref into the four edit fields for the corners corresponding to the pressure. Enter 0.1 into the Duration of time-dependent simulation (maximum time) edit field. Plot the velocity field as arrows and pressure as contour plot to see the vortices of the flow field. By plotting and visualizing the difference between the computed and reference variables, the overall accuracy of the simulation can be estimated. Enter u-u_ref into the User defined surface plot expression edit field. 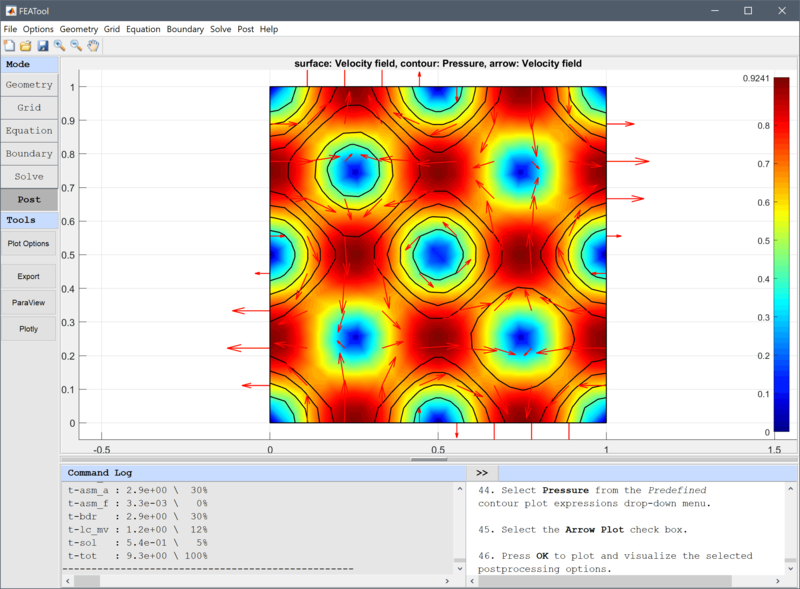 The vortex flow fluid dynamics model has now been completed and can be saved as a binary (.fea) model file, or exported as a programmable MATLAB m-script text file, or GUI script (.fes) file.